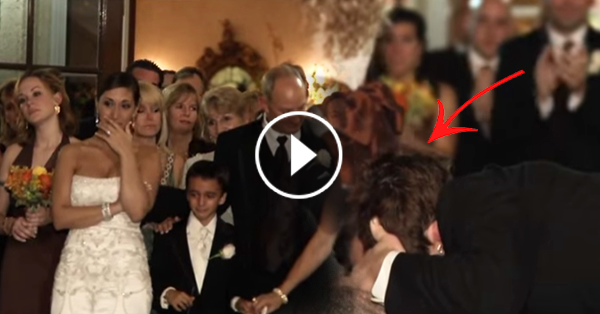 WATCH: This Groom Kissed Another Woman Right In Front Of His Bride, After A Few Seconds, His Bride Was In Tears! Weddings are often a jubilant celebration for married couples, they invite all their friends and family for the occasion to witness their loving union. Grand preparations are often made to accommodate the bride and groom's friends and family that arrive to celebrate their profession of the matrimonial bond. At the wedding reception it is often customary for the bride and groom to dance with their father and mother respectively before sharing their first dance together. When Luke Rheault danced with his mother, it was truly memorable for everyone at the reception because of what happened during the Mother and Son Dance. After 8 Years of being a couple Luke and his fiancée Kristeena finally decided to tie the knot. At their wedding reception Luke asked his mom to dance with him, which shocked everyone since his mother was in a wheelchair because she suffers from Amyotrophic Lateral Clerosis, more commonly known as ALS, a progressively debilitating disease. He took a knee to be at her level and shared a dance with her in a wheelchair. Luke repeatedly kissed his mother while dancing with her, . There wasn't a dry eye amongst those in attendance, including Kristeena, the newlywed. Luke's mom started shedding tears as well since she was probably lamenting the fact that she would never see the fruition of Luke and Kristeena's marriage. Luke remained stoic probably keeping his composure for his mom's sake. Unfortunately Luke's mom eventually succumbed to the illness but Kristeena says that she's happy that her husband was able to share one last special moment with his mother before she passed on. Before you clicked on this article were you angry? How about now after reading the whole story? Never judge a story by it's headline alone.